This week we celebrate our freedom to read. 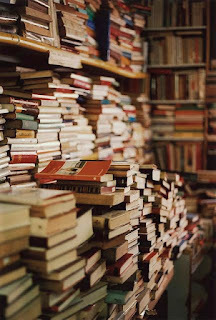 Books fill our lives and now come in all shapes and forms. They are inanimate objects until you open one up and read the words on the page. They educate and illuminate, teach powerful ideas and words, introduce old and new concepts and cultures, exposes the how's, why's and what's of life. They can lift us up and make us laugh or fill us with sweet joy as well as sorrow. They open our eyes, hearts, souls and minds. We tear them apart and analyze, argue, debate and think about what if. Books are readily available anywhere from libraries to book stores to grocery stories to the little library at your neighbor's house. There are some individuals who find those words and the thoughts created by those individual letters objectionable and seek to prevent others from reading them. Fortunately, because we are a free country, we have the freedom to read what we want, where we want and when we want. However, with that freedom comes responsibility, especially for parents. We are tasked individually with deciding not only how we view what we are reading and how it affects us personally, but also when our children are ready and able to understand different words or ideas or thoughts. What's right for one child may not be right for another and it is up to the parent to decide. Not anyone else. We can respectfully agree or disagree with one another, but no one should take away our right to read or not read what we choose. Which brings us to Banned Book Week, started 35 years ago by the American Library Association Office of Intellectual Freedom, in response to challenges and requests to ban books from libraries and bookstores due to their content. Historically, there have been challenges and bans and burnings around the world since 210bc starting with Chinese emperor Shih Huang Ti to the present with ISIS destroying books and historical documents in Mosul. Celebrate your freedom to read with one of many challenged books including classics and children's books as well international books banned by various governments. Check out this article about the massive list created by Argentine artist Marta Minujín and researchers from the University of Kassel.